Get a sense of the local culture at Bou Inania Medersa and Volubilis. Popular historic sites such as Synagogue Ibn Danan and Tombe dei Merenidi are in your itinerary. There's lots more to do: wander the streets of Medina of Fez, stop by Coin Berbere, admire the landmark architecture of Bou Inania Medersa, and explore the world behind art at Nejjarine Museum of Wood Arts and Crafts. To find maps, more things to do, and more tourist information, refer to the Fes trip itinerary builder. New Orleans, USA to Fes is an approximately 22-hour flight. The time zone difference moving from Central Standard Time to Western European Time is 6 hours. Traveling from New Orleans in May, you can expect nighttime temperatures to be little chillier in Fes, with lows of 53°F. 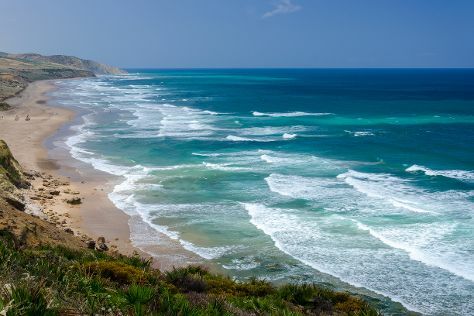 On the 2nd (Fri), wrap the sightseeing up by early afternoon so you can drive to Asilah. Asilah is a fortified town on the northwest tip of the Atlantic coast of Morocco, about 31km south of Tangier. On the 3rd (Sat), relax and rejuvenate at some of the top local wellness centers and then stroll through Paradise Beach Kaf Lahmam. 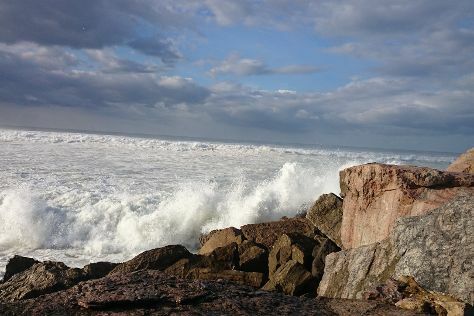 To see reviews, ratings, maps, and other tourist information, go to the Asilah online itinerary creator. Getting from Fes to Asilah by car takes about 4 hours. Other options: take a train. Traveling from Fes in June, you will find days in Asilah are a bit cooler (80°F), and nights are about the same (63°F). Finish up your sightseeing early on the 3rd (Sat) so you can go by car to Rabat. Kasbah des Oudaias and Chellah are good opportunities to explore the local culture. Deepen your sense of the past at sights like Hassan Tower and Cathedrale Saint-Pierre. There's lots more to do: kick back and relax at Plage de Rabat, admire nature's wide array of creatures at Jardin Zoologique National de Rabat, don't miss a visit to Mausoleum of Mohammad V, and admire the natural beauty at Andalusian Gardens. For traveler tips, more things to do, reviews, and other tourist information, read our Rabat sightseeing planner. You can drive from Asilah to Rabat in 2.5 hours. Another option is to take a train. In June, daily temperatures in Rabat can reach 79°F, while at night they dip to 59°F. Wrap up your sightseeing by early afternoon on the 6th (Tue) to allow time for the car ride to Marrakech. Your cultural itinerary includes sights like Medina of Marrakech and Koutoubia Mosque and Minaret. Popular historic sites such as Bahia Palace and Menara Gardens and Pavilion are in your itinerary. There's lots more to do: browse the exhibits of Jardin Majorelle, browse the eclectic array of goods at Jemaa el-Fnaa, don't miss a visit to Koubba Almoravid, and enjoy unforgettable views with a balloon tour. To see photos, traveler tips, other places to visit, and other tourist information, read Marrakech travel itinerary creator. You can drive from Rabat to Marrakech in 3.5 hours. Other options are to do a combination of train and flight; or take a train. Expect somewhat warmer temperatures when traveling from Rabat in June; daily highs in Marrakech reach 94°F and lows reach 65°F. Finish up your sightseeing early on the 12th (Mon) so you can go by car to Essaouira. Start off your visit on the 12th (Mon): take a stroll through Medina of Essaouira and then kick back and relax at Essaouira Beach. Here are some ideas for day two: take a leisurely stroll along Essaouira Fishing Port, make a trip to Essaouira Ramparts, and then trek along Ecotourisme et Randonnees. To find more things to do, traveler tips, maps, and other tourist information, you can read our Essaouira trip builder. Getting from Marrakech to Essaouira by car takes about 2.5 hours. Other options: drive; or take a bus. When traveling from Marrakech in June, plan for little chillier days in Essaouira, with highs around 76°F, while nights are about the same with lows around 62°F. On the 14th (Wed), wrap the sightseeing up by early afternoon so you can drive to Sidi Ifni. Sidi Ifni is a city located in southwest Morocco, on the shores of the Atlantic Ocean. On the 15th (Thu), enjoy the sand and surf at Legzira Beach. To see other places to visit, maps, more things to do, and tourist information, go to the Sidi Ifni sightseeing planner. Traveling by car from Essaouira to Sidi Ifni takes 5.5 hours. Alternatively, you can drive. On the 15th (Thu), wrap the sightseeing up by early afternoon so you can drive to Agadir. Start off your visit on the 16th (Fri): steep yourself in history at Agadir Oufella Ruins, don't miss a visit to Seafront promenade, and then enjoy the sand and surf at Agadir Beach. Get ready for a full day of sightseeing on the 17th (Sat): try your luck at Shem's Casino, steep yourself in history at Agadir Kasbah, and then kick back and relax at Taghazout Beach. 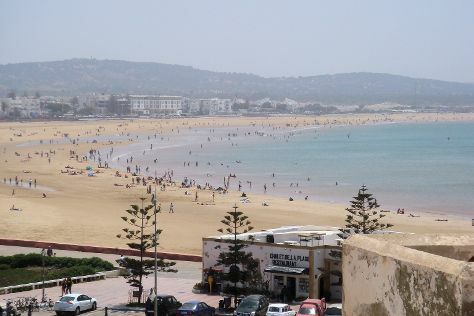 To see reviews, maps, ratings, and other tourist information, use the Agadir vacation builder. Traveling by car from Sidi Ifni to Agadir takes 3 hours. Alternatively, you can drive; or do a combination of taxi and bus. Wrap up your sightseeing on the 18th (Sun) early enough to travel to Casablanca. Start off your visit on the 18th (Sun): enjoy the sand and surf at Ain Diab and then wander the streets of Quartier Habous. On the 19th (Mon), you'll have a packed day of sightseeing: admire the landmark architecture of Hassan II Mosque, visit a coastal fixture at Phare d'el Hank, browse the different shops at Grains de Sel, Le Kiosque Gourmand, then don't miss a visit to Old Medina of Casablanca, and finally make a trip to Place Mohammed V.
For ratings, more things to do, where to stay, and other tourist information, you can read our Casablanca custom trip planner. Do a combination of flight and train from Agadir to Casablanca in 3 hours. Alternatively, you can drive; or take a shuttle. In June in Casablanca, expect temperatures between 77°F during the day and 66°F at night. On the 20th (Tue), you're off tohome.